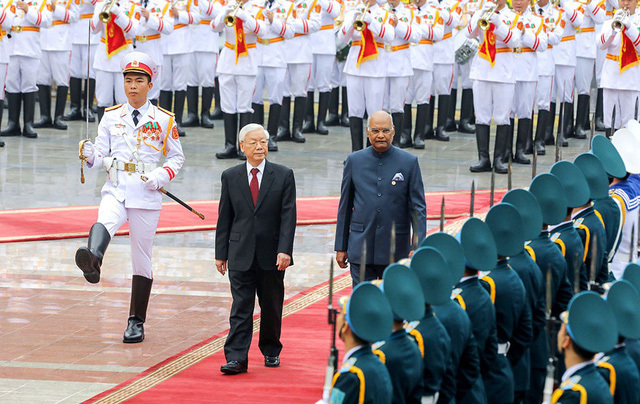 Vietnam’s Party General Secretary and State President Nguyen Phu Trong and Indian President Ram Nath Kovind have consented to further boost the two nations’ relationship and elevate bilateral trade turnover to US$15 billion in the near future. President Kovind joined talks with the Vietnamese leader in Hanoi on Tuesday as part of his first state visit to the Southeast Asian country from November 18 to 20. According to Vietnam’s Ministry of Foreign Affairs, both sides stressed the significance of deepening the bilateral comprehensive strategic partnership in all sectors. The heads of state agreed to establish practical policies and measures to elevate two-way trade value from the current $12.8 billion to $15 billion in the coming time. They suggested boosting ties in trade and investment, renewable energies, and high-quality agriculture, while encouraging the Vietnam National Oil and Gas Group and the Oil and Natural Gas Corporation of India to actively explore oil and gas in Vietnam, as well as seeking cooperation models with a third country. Both sides highlighted the importance of promoting connectivity and accelerating procedures to help low-cost Vietnamese carrier Vietjet soon launch its direct flights between Ho Chi Minh City and New Delhi. The Indian president pledged to continue providing scholarships for Vietnamese students. The leaders praised the effective defense and security cooperation between the two nations, agreeing to step up collaboration in human resources development and strengthen the affiliation between the two nations’ armed services. They applauded the implementation of a $100 million credit package to build high-speed patrol vessels for Vietnam’s border guards and agreed to soon organize the first marine security dialogue. Efforts will also be exerted to continue close coordination and mutual support at multilateral forums, particularly the United Nations. Vietnam is a pillar in India’s ‘Act East’ policy, as well as a key partner in Southeast Asia, President Kovind stated. Regarding the situation in the East Vietnam Sea, President Trong welcomed India’s stance on the issue over the years, hoping that India will continue their support in the future. Following the talks, the two leaders witnessed the signing of numerous important documents. The Indian president also met with Prime Minister Nguyen Xuan Phuc and National Assembly Chairwoman Nguyen Thi Kim Ngan on the last day of his state visit.